When standing in the streets of Santiago, surrounded by whistles and horns, the snowcapped Andes stand in the east as an invitation to escape. When city dwellers do choose to escape the city, a favorite spot is Baños Colinas set high in the Andean foothills. Here at a lung-testing 8,200 feet—where even the air in the middle of summer has a welcome alpine chill—travelers can slink into thermal springs that are naturally heated by the earth. The waters here have healing qualities and rich deposits of calcium, and you’ll notice your skin is soft and smooth after this alpine soak with a view. Speaking of views, a popular activity in Baños Colinas is hiking amidst the hills, particularly the trail to a panoramic viewpoint of San José volcano. Serious alpinists can continue farther to the highest peaks and ridgelines, although most travelers are content with a day hike followed up by a soothing soak in the naturally heated pools. To extend the adventure into the night, bring a tent and sleeping bag to camp atop the hills—cradled beneath a blanket of stars that bursts through the inky black night. Baños Colinas is located 2.5 hours from the capital city of Santiago. The final eight miles are on a rough dirt road that can often be impassable in winter, and travelers should prepare for inclement weather during any time of the year. Admission to the hot springs is approximately $11 for adults and $6 for children, and while camping here is a popular activity, modern facilities are limited. 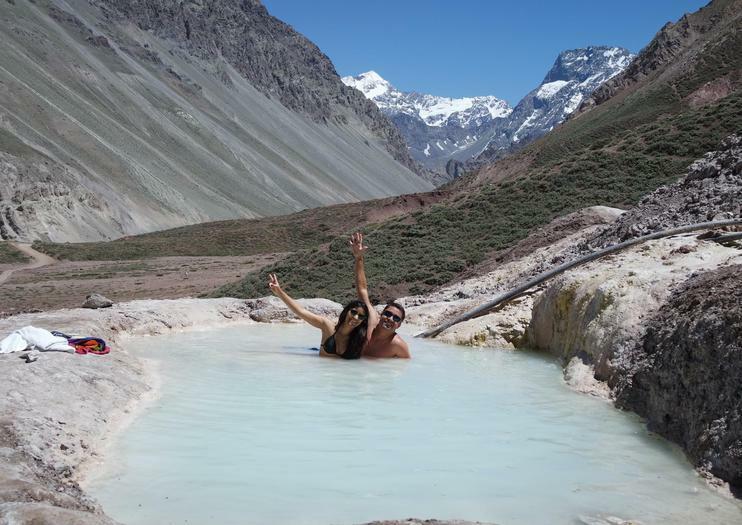 Soak your worries away with the famous Andes Mountains as a backdrop during this full-day excursion to Colina Hot Springs from Santiago. Travel with a small group of no more than seven guests as you head into the foothills of this famous mountain range, stopping to relax in these naturally heated pools known for their healing properties. Cap it all off with an included picnic lunch with wine. Enjoy a unique walk in the middle of the Andes. Immerse yourself in the hot springs Baños Termas de Colina in the Cajón del Maipo and feel the power of the thermal waters of this beautiful place. Live a different and wonderful day seeing beautiful landscapes at a place located just 1 hour away from Santiago de Chile. This tour includes a picnic with the group. Indulge to a night of star gazing and relaxing at Colinas Hot Springs (Termas Colinas). This is an adventure tour experience that starts at 7PM to return at about 1AM. The Hot Springs are at the end of the G-25 route in San Jose del Maipo and we ride onboard a comfortable mini van through the mountains to arrive to this unique destination. Visit the Cajón del Maipo, El Yeso Dam, and mountain hot springs on a full-day tour from Santiago into a dramatic gorge flanked by high peaks. With a picnic lunch and wine served by a gorgeous alpine lake, this tour is a relaxing alternative to more strenuous mountain tours, and all transport is in the comfort of a climate controlled minivan. Discover the dramatic landscape and wildlife of Cajón del Maipo on a private, 8-hour trip from Santiago that includes a barbecue lunch and wine. Watch for the endangered Andean condor as you explore the rugged mountain scenery, passing through remote villages on your way to El Yeso dam and reservoir. This private tour includes a picnic lunch, bottle of wine, and round-trip transport from your Santiago hotel. If you so choose, there's also an option that include entrance to the Baños Colina Hotsprings, a natural thermal spring with waters as hot as 70º C.
The mountain range of the Andes offers unparalleled views for those who know the mountain, we invite you to live the experience in the Andes.